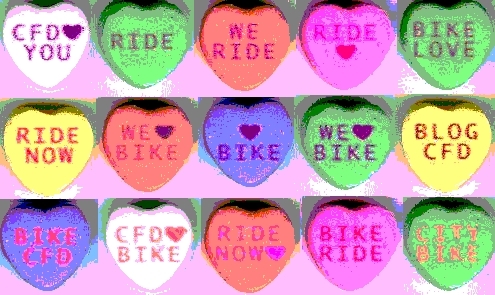 Happy Valentine’s Day from Car Free Days! I hope you and your loved one(s) found a way to express yourselves in a less-than-consumerish fashion on this dorky, but harmless holiday. For us, the big evening involved me riding down the hill for take-out Thai, and a less-cheap-than-normal bottle of wine. Good times. This may surprise some of you, but I really enjoy Valentine’s day. I have wonderful, cycling wife that I love dearly; I relish any excuse to celebrate our fantastic relationship (even though she thinks Valentine’s day is stupid). Factor in the hour I spent bike commuting to and from work and I think that makes for a pretty damn good day. Full disclosure: I saw one of our readers/neighbors as I rode into work this morning. He said that he preferred Anne’s posts because she was more positive. Since I’m nothing if not a crowd pleaser, consider this my effort to be a good, perky, American (even though it’s debatable how good that really is). So, how’d I do, Dave? This entry was posted in bikes, consumerism, dates and tagged bikes, carfreedates, commuting, dorky, happienss, holidays, love, valentines's day. Bookmark the permalink. So you’re working the Good Cop/Bad Cop routine, is it? Or, maybe, make that Eeyore and Tigger. Whatever, I think that complementary points of view are always better than one uniform perspective. Work it! …Don’t worry, Val. It was a one time thing. Being perky is just too hard for me. Valentines Day is great, anyone who hates Valentines Day is lying! I went to a Cycle Fashion Show on mine. I love my bike too! your post about Hizonner was right on. When Greg starts riding them maybe he can talk to me about bike safety. Hey Greg love to see you at the next Crit Mass. …anyone who trades beer for old casettes is a crowd pleaser in my book.